Unless you own specialty knives that should only be sharpened with a whetstone, an electric sharpener is the easiest way to keep your kitchen knives sharp. It’s especially helpful for busy kitchens where knives get dull quickly. It saves you time and ensures your knives are always well sharpened. This keeps them in good shape for longer and makes chopping up stuff easier and safer for you. In this buying guide, I’ll review the 5 best electric knife sharpeners you can buy online. 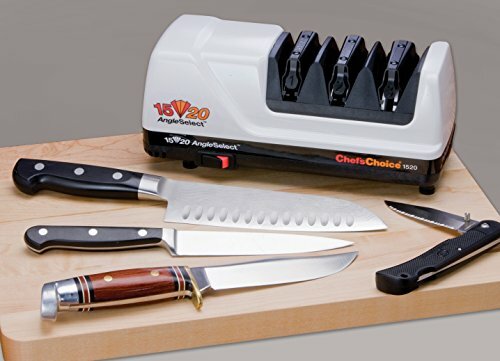 They are all easy to use even for beginners and leave your knives properly sharpened without Knicks or scratches. But first, here are some things to keep in mind when you are shopping for an electric knife sharpener. Electric knife sharpeners and whetstones work in the same way; using an abrasive surface to remove fine bits of metal from a knife’s edge to make it sharper. Electric knife sharpeners come with one of two types of grit: diamond or ceramic. Diamond grit is harder and tougher. It will sharpen a knife faster and is likely to last longer as well. 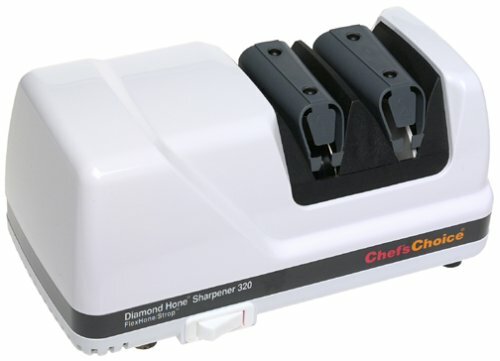 Because the grit tends to be courser, diamond knife sharpeners are ideal for sharpening old and very dull knives. Ceramic grit is finer and more delicate. A ceramic electric knife sharper is best for honing already-sharp knives. The fine grit provides a finer and smoother finish. When you are shopping for an electric knife sharpener, check the number of slots on the machine. This indicates how many stages it has. Basic knife sharpeners are 1-stage. There’s only one slot for sharpening a knife. 2 and 3-stage sharpeners have 2 or 3 slots. The first slot uses coarse grit to sharpen a dull knife and remove metal. You should only use it for a knife that hasn’t been sharpened in a long while. The second and third stages use finer grit to give the knife a smooth sharp finish. c. Can It Sharpen Serrated Knives? 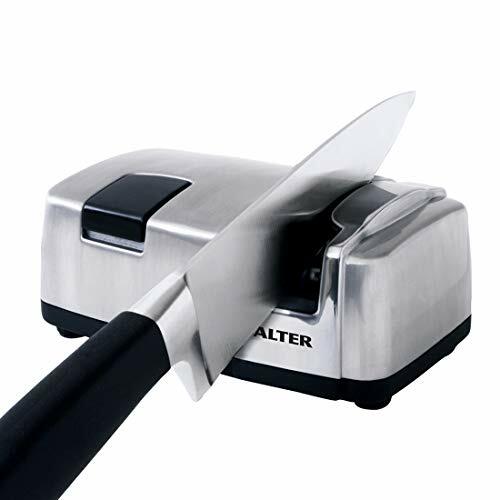 Many electric knife sharpeners are designed to handle straight-edged knives. But there are a few that can also sharpen serrated knives and even scissors. You should also check whether the machine can sharpen Asian knives, if you own some. In contrast to most knives which are sharpened on both sides, Asian knives are sharpened only on side. Look for an electric knife sharpener with an easy to use angle guide. If the guide is adjustable that’s even better. It allows you to sharpen different knives at different angles depending on what they are used for. The combination of grit rubbing against the blade and the whirring motor can be quite noisy. If there are pets or a baby around who might be woken up or scared the noise, look for a quieter electric knife sharpener. This electric sharpener can sharpen most kinds of knives including normal western straight-edge knives, European-style knives as well as serrated knives. It’s also good for pocket and sporting knives. It is a two stage sharpener. The first stage uses fine diamond grits for the first round of sharpening. In the second stage polishing disks coated with ultra-fine diamond abrasives give your knives a professional finish. You don’t have to worry about positioning the knife at the right angle. The sharpener has 20-degree angle guides integrated, ensuring your knives get a precision finish. As you sharpen your knives, the rubber feet keep the sharpener stable on your kitchen counter. This is important for your safety and also ensures your knives are sharpened evenly. Cleaning the sharpener is easy. For one, you don’t have to go looking for metal filings all over the inside where they have been scattered. There’s a magnet inside that catches all the fine bits of metal from your knives, making cleaning a breeze. There are also no messy oils you need to wipe up. Effortless knife sharpening. Precision angle guides make for easy and quick work even if you are using an electric knife sharpener for the first time. Cleaning is easy too. Professional-level finish thanks to the 2-stage system. Ideal for most kinds of knives (except Asian knives). A bit pricey but definitely worth it. This is also a 2-stage electric knife sharpener with two slots per stage (for each side of the knife). It doesn’t use diamond or ceramic abrasives. Each of the stages has a wheel made from aluminium-oxide. Is it any better than diamond or ceramic? Well, it works just about as well. The coarse abrasives in the first stage quickly cut away metal. It makes for quick work when you are sharpening a dull knife. 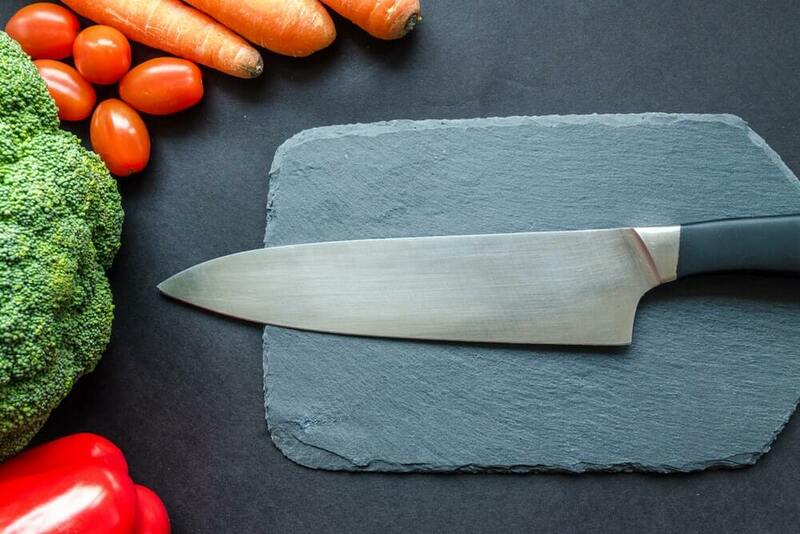 The second stage gets really fine, ensuring your knife comes out with a chef-approved edge. The only complaint I’ve seen from customers is that the 15-degree angle guides are not as precise. You have to experiment with different angles until you hit the sweet spot. There is a slight learning curve involved for first-time users. But once you get used to it, it’s easy and fast to use. It sharpens most kinds of knives including 1-sided Japanese knives, pocket knives and most kitchen knives. Metal filings collect on a tray at the bottom of the sharpener, making clean up easy. Ideal for most kinds of knives including bread knives, Japanese-style knives and pocket knives. This is the most expensive electric knife sharpener on our list. But it’s also the only one with a 3-stage sharpening system. It is also one of the most versatile knife sharpeners. Whatever kinds of knives you have – western, Japanese, serrated, pocket knife, sport knife – the sharpener can handle all of them. It allows for two sharpening angles: 15 degrees for Asian knives and 20 degrees for western knives. The angle guides are easy to use. You don’t have to keep trying different angles before you find the right one. Being a 3-stage sharpener, it can handle even the dullest knife you have that hasn’t been sharpened in years. Start in the first stage and move on until you get a polished edge in the last stage. For knives that are in a relatively good condition, you’ll only need to use the second and third stages. For daily sharpening, 10 seconds on the third stage is enough most of the time. All stages use diamond abrasives that get increasingly fine with each slot. 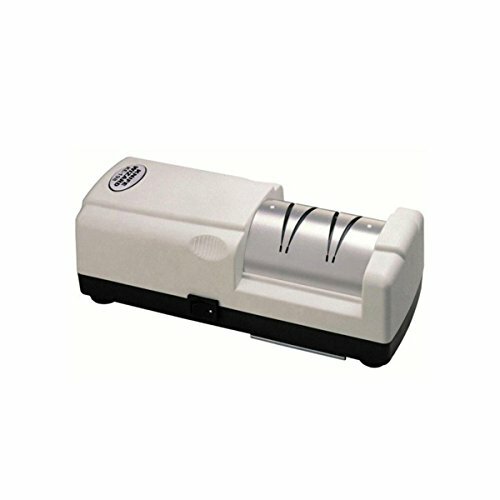 A magnet inside the sharpener catches the metal fillings, making cleaning easy and quick. Easy to use – beginner-friendly angle guides. Versatile – can be used with most types of knives. If you are looking for a cheaper electric knife sharpener, I recommend this one. 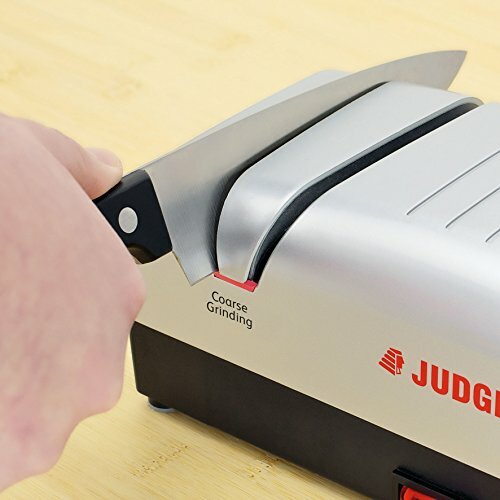 Its performance is not on the same level as the other premium brands on this list but it will do if you just need a basic kitchen knife sharpener. It is a single stage sharpener so it’s only ideal for ordinary straight-edge knives that are in a relatively good condition. Do not use it to sharpen serrated knives. I also don’t recommend it for old and very dull knives. It’ll take forever to get a decently sharp edge. The sharpening mechanism uses ceramic pins that are spring-loaded to provide the perfect amount of pressure and hold the knife at the right angle. The one-touch operation is easy to use. Cleaning and maintenance is also easy. Ideal for most knives (except serrated ones). This is another good option if you are looking for something cheaper for your kitchen knives. It doesn’t produce the same results as more expensive sharpeners but it will do for most of your sharpening needs. It is a 2-stage system so it can handle fairly dull knives and produce a polished sharp finish in the final stage. It can sharpen the usual straight-edge knives, Asian knives, serrated knives, steak knives as well as pocket knives and scissors. Two filing trays at the bottom of each set of slots makes cleaning the sharpener easy. The main complaint from customers about this sharpener is the noise and vibrations. You are going to have trouble keeping it in place on a smooth kitchen counter. They recommend placing a paper towel under it to reduce the noise and movements. One of the most affordable 2-stage electric knife sharpeners. Sharpens all kinds of knives including serrated, straight-edge, Asian and pocket knives. Can also sharpen scissors and flat-bladed screw drivers.